In the heart of Groveland is the historic Groveland Hotel. Featuring 17 individually themed rooms, each with fine amenities such as a feather bed, private bath, coffee brewer and more. Full complimentary breakfast included. The hotel has a fully stocked wine cellar and the restaurant prides itself on the use of seasonal California ingredients on daily menus. AAA discount available. Downtown Groveland is home to this charming Inn. Here you will find affordable and casual lodging. Choose from ten rooms and be sure to stop in at Cafe Charlotte, full service restaurant and bar. Get your motor runnin’ for your adventure by filling up on the daily pancake buffet breakfast. Blend modern amenities with old world charm and voila, your excursion to the outdoors is no longer a rustic sob story but rather a pampered escape. Each room at All Seasons displays a scenic wall mural hand painted by a local artist. Inn perk: rooms include either a steam room or Jacuzzi tub and fire place. Standard rooms available. For large groups, consider the “family-style” rooms which have a dining area with microwave and refrigerator. Motel perk: A heated pool to take the river chill away and relax those exhausted muscles. The historic Evergreen Lodge was built in 1921. Nestled on the north-western side of Yosemite National Park, the lodge offers a variety of accommodations from furnished traditional and family cabins to newer one-bedroom cottages as well as camping. The property tavern offers fine dinning or lighter fare and cocktails in a warm, cottage setting. The lodge provides a variety of recreational guided tours and activities in and around Yosemite. Feeling tired or sore after all day adventures in and around the park? No worries, an on-site massage awaits you at the lodge when you return! Camping perk: All camp gear included at campsites. Yosemite National Park is just a quick drive from the Tuolumne River. Take an extra day off work and spend a night in one of California’s most incredible National Parks. During peak summer months, make reservations for camping or a hotel room early. Modeled after a Bay Area mansion of the late 1800s ‘Italianate Revival’ style this 90 acre property has a variety of rooms or a single private cabin available to accommodate guests. 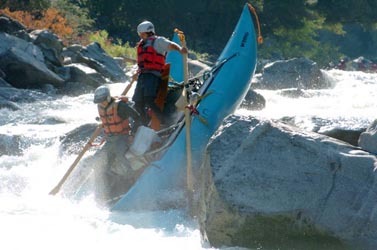 Hiking a trail from “the Rose” to Clavey Falls, one of the Main Tuolumne’s most challenging whitewater rapids, is an option for adventurous guests to scout this run before heading to the river. Other activities include horse trail rides, a game of billiards, playing the piano in the music room, or relaxing with a massage. B&B perk: full country breakfast served either in the dining room showcasing a large hand-painted mural of Yosemite Falls or on the quaint screened-in porch. Military Discount available. Located along the South-Fork Tuolumne River this beautiful resort property offers tent and RV campsites, yurts, bunkhouse cabins and a hostel. Guests can rent paddle boats and kayaks or partake in other activities like swimming, fishing, and cycling. Though this resort-style facility offers tent and RV camping, there are also a variety of cabins and yurts available. There are also a few unusual and convenient areas of the park not typically found in campgrounds including a general store, laundry room, swimming pool, exercise trail, club-house, playground and petting zoo. Pets are welcome however there are no kennels provided. Ten separate campgrounds are found within the Groveland Ranger District. Those mentioned below are on Hwy 120 and are nearest to the town of Groveland. Highlights of the campgrounds include developed sites, well water and pit toilets. Large trailers or RV’s can not be accommodated. No advance reservations are taken. The Park contains 13 popular camp grounds with 7 taking advance reservations. Advanced reservations recommended for large groups.